Herbs are powerful healing tools when used to help balance the body. Inflammation is your body’s way to protect itself from injury, infections, and other pathogens. While inflammation can be beneficial when it comes to acute injuries and illness, if it turns chronic, it can also become harmful to your health. 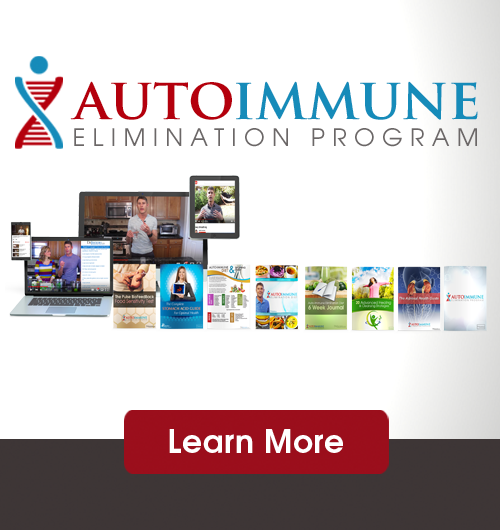 Chronic inflammation can last for months or years. It is the underlying reason for almost every major health condition and disease. In this article, you will learn what inflammation is, what the difference between acute and chronic inflammation is and what its causes and consequences are. I will also share some powerful strategies on how to lower inflammation and reduce the risk of disease with anti-inflammatory herbs instead of non-steroidal anti-inflammatory drugs (NSAIDs). Inflammation is your body’s way to fight against any potential harm, such as injuries, infections, and toxins. It is part of your body’s inherent immune response. When your body senses damage to its cells, it releases chemicals to trigger a response from your immune system for your protection. The main goal of inflammation is to protect you from harmful invaders and promote fast healing and recovery. Inflammation itself is not bad. Without inflammation, wounds would become septic and even minor infections could result in tissue damage and become deadly. However, not all inflammation is good. There are two types of inflammation: acute and chronic. Acute inflammation can enhance recovery from an injury or short illness, however, when inflammation becomes chronic, it can lead to further health problems, including chronic pain and disease. Acute inflammation is your body’s response to short-term, acute injuries, infections, or illness with localized effects. Your cells release chemicals to create inflammation to protect your body, prevent infections from spreading, and aid recovery. Your blood vessels dilate, blood flow increases and white blood cells rush to the affected area to promote fast recovery. Acute inflammation is usually characterized by pain, swelling, redness, heat or even loss of function. For example, if you cut your finger while preparing dinner, you may experience swelling, redness, and pain. If a mosquito bites you, it will result in redness, swelling, and itching. During allergy season, you may experience sneezing or redness in your eyes. If you catch a cold, you may have a red, sore throat with swelling, runny nose, and other related symptoms of inflammation (1). In some cases, acute inflammation may be internal, such as if you have acute appendicitis. Internal acute inflammation may also be characterized by pain or other symptoms. Acute inflammation must not be mistaken for an infection. An infection caused by harmful substances, such as bacteria, virus, or fungus usually results in inflammation. However, inflammation can happen without an infection. For example, if you twist your ankle or scrape your knee, it will likely turn red, swell up, and hurt due to inflammation but without any infection. If infection and inflammation are both present, as you recover from the infection, your inflammation will subside as well. Acute inflammation is short-term. It may last for a few hours, a few days, or in case of some more serious injuries, a few weeks. Unlike acute inflammation, chronic inflammation is long-term. 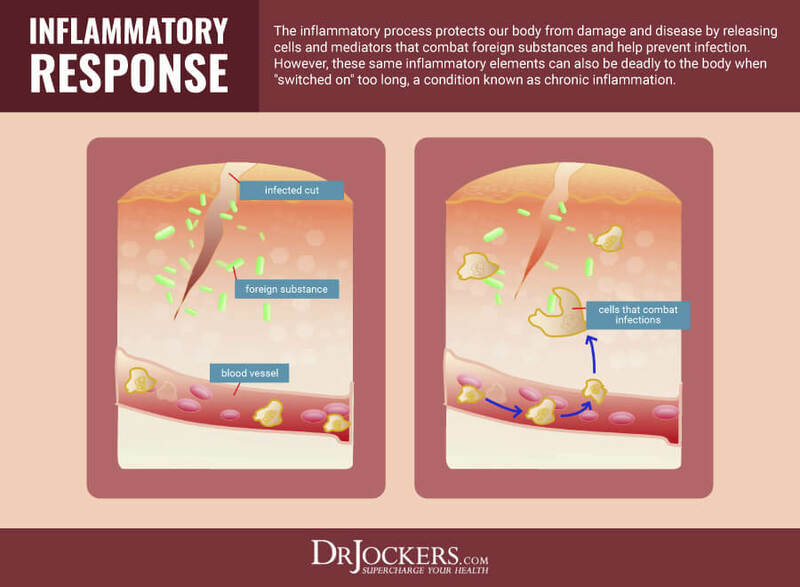 When you have chronic inflammation, the inflammatory response is on-going leaving your body in a constant state of alert trying to defend you from potential harm. Instead of acute injuries, chronic inflammation is caused by an excessive stress load on your body, including physical, emotional, and chemical stressors. As a result of these constant stressors, your body ends up trying to constantly defend itself, thus overwhelming your immune system. This chronic inflammatory stimulus results in increased inflammation, more white blood cells, cell changes, and eventually tissue and organ damage. While acute inflammation is necessary and beneficial for your health and recovery, chronic inflammation may have a harmful impact on your health. Chronic inflammation can play a role in a variety of health conditions, including metabolic syndrome, non-alcoholic fatty liver disease, type 2 diabetes, cancer, asthma, Alzheimer’s disease, and heart disease. Chronic inflammation results in 7 out of the 10 leading causes of death (2, 3). Unlike acute inflammation, chronic inflammation can last for several months or years. It continues until the cause of the inflammation is addressed. You must address the underlying causes of your inflammation in order to stop it and prevent further damage in your body. Acute inflammation is caused by an acute injury, infection, or illness. Chronic inflammation is a sign of an overtaxed body. 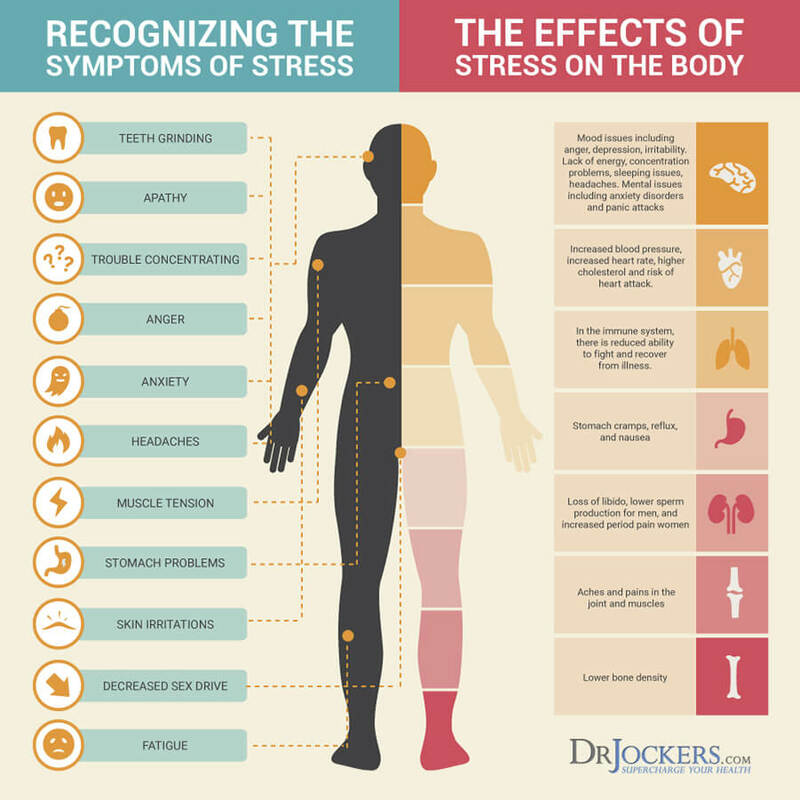 It is caused by excessive stress on your body often due to a combination of reasons, including physical, emotional, and chemical stress. When your body is under sustained stress due to an inflammatory diet, chronic emotional stress, the burden of chemical toxins and poor sleep, it feels constantly under attack. It cannot differentiate a poor diet or an ongoing emotional battle from the distress caused by a bug bite or banged toe. All it wants to do is to protect you which results in a constant emotional response and chronic inflammation. An inflammatory diet low in nutrients is one of the top causes of modern-day chronic inflammation. Certain foods are known to trigger your immune system and result in the over-production of pro-inflammatory cytokines and the under-production of anti-inflammatory cytokines. Cytokines are proteins secreted by your immune system that regulate your immune response (4). Inflammatory foods include sugar, refined carbohydrates, saturated fat, trans fat, omega-6 fatty acids, mono-sodium glutamate (MSG), gluten, casein, aspartame, and alcohol. Foods that you are allergic to or sensitive to may also cause chronic inflammation (5). The Standard American Diet (SAD) relies heavily on processed food, refined sugars, starches, and unhealthy fats. It lacks greens, vegetables, and fruits and hence is incredibly low on vitamins, minerals, and antioxidants. It’s also very low in fiber which is essential for healthy digestion and detoxification. The SAD diet has been linked to increased risk of health conditions, such as diabetes, cardiovascular disease, and cancer, all of which are linked to chronic inflammation (6). 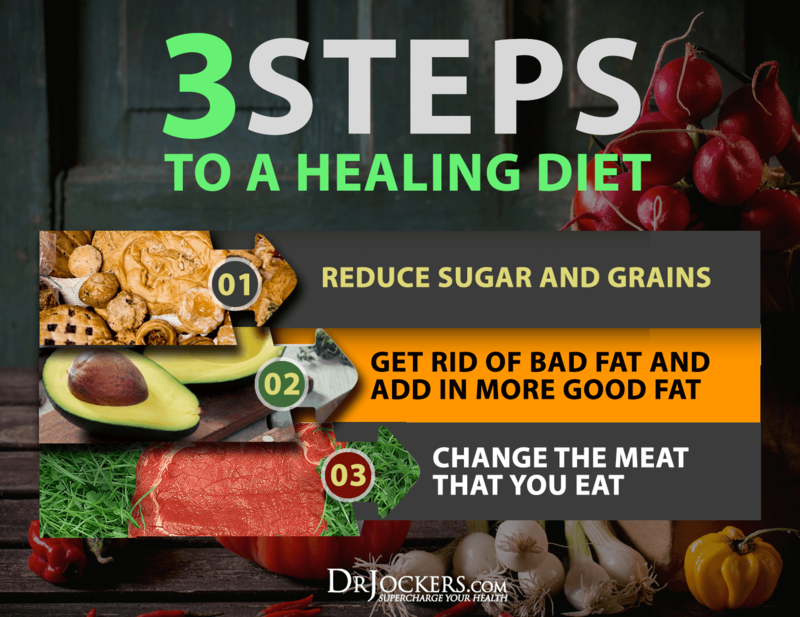 To reduce inflammation, make an effort to move away from an inflammatory and SAD diet to an anti-inflammatory one that’s rich in organic whole foods, such as greens, vegetables, fruits, anti-inflammatory herbs, good fats, and high-quality animal products. You can learn more about how an anti-inflammatory, healing diet can better your health in this article. 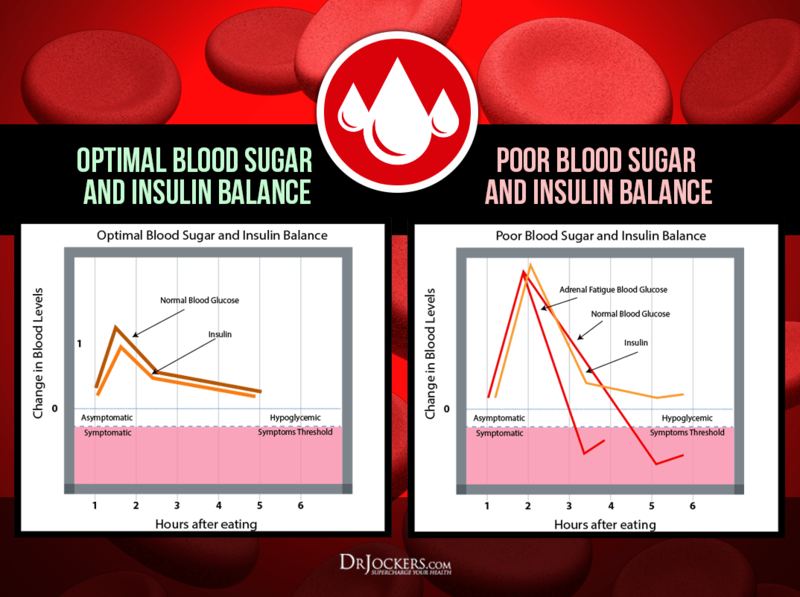 High blood sugar, insulin resistance, and chronic inflammation have all been linked to chronic health conditions, such as type 2 diabetes, obesity, cardiovascular disease, and high blood pressure. Eating an inflammatory diet and too much sugar can lead to blood sugar imbalances that cause inflammation and the overproduction of inflammatory cytokines. Inflammatory cytokines can lead to increased insulin resistance and elevated blood sugar that only feeds the cycle of continuous inflammation and blood sugar problems. Furthermore, chronically elevated blood sugar levels result in advanced glycation end products (AGEs) that consequently increase inflammation and and produce risk of oxidative stress (7, 8). If you are looking to balance your blood sugar levels, check out this article to learn about foods that can help you. 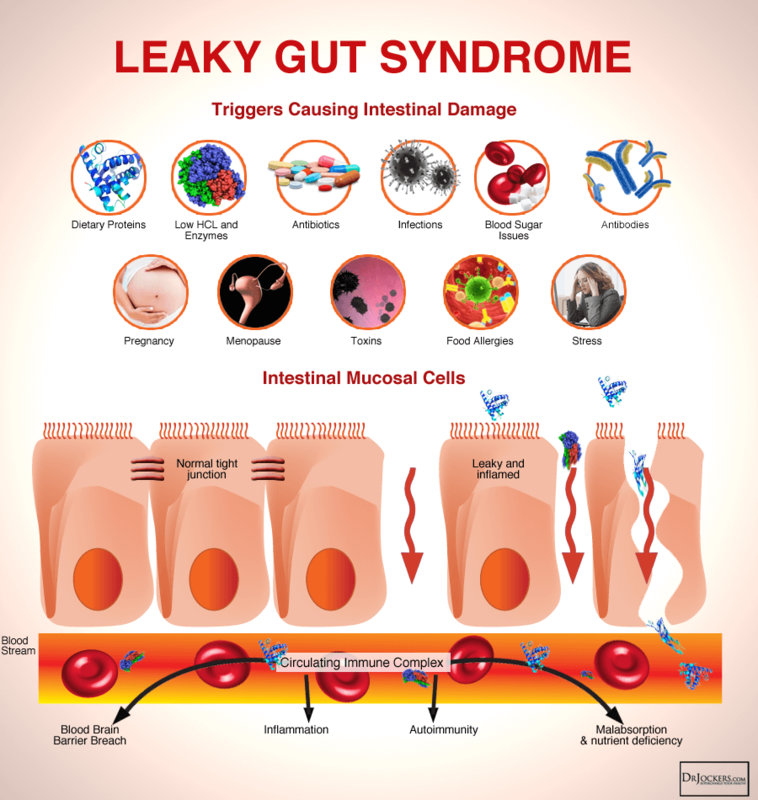 Leaky gut syndrome is a condition characterized by damaged cell lining in the intestines that cannot regulate what goes in and out. Naturally, your gut is a semi-permeable organ that allows micronutrients to pass through into the bloodstream to help you absorb nutrients from your food. However, inflammatory foods, toxins, infections, and stress can lead to holes in your intestinal wall resulting in leaky gut. Once your gut becomes leaky, larger particles, including undigested food particles, toxins, and microbes can get through and escape into your bloodstream. Your immune system will recognize them as foreign invaders and pathogens. As an attempt to protect you, it releases an immune response which leads to long-term inflammation. Leaky gut syndrome is often characterized by gas, bloating, constipation, indigestion, and other digestion problems. 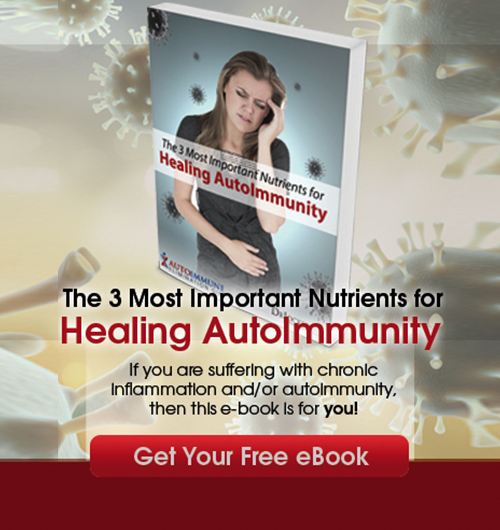 However, it can also lead to more serious health issues, including autoimmune diseases (9). Chronic stress plays an enormous role in the development of chronic inflammation. Emotional and life stress may lead to poor eating habits, consumption of alcohol, lack of exercise, and poor sleeping habits that may all increase the risk of inflammation (10). Chronic inflammation may also increase the risk of depression and anxiety. Chronic stress can put your body in a state of persistent flight-or-fight that may result in digestive disorders and anxiety. This feeds the cycle of further inflammatory behavior, inflammation, and emotional health issues (11, 12). Getting a good night sleep is non-negotiable when it comes to your health and well-being. Sleep is the time when your body can rest, recover, and promote healing. Poor sleep habits and sleep loss can result in chronic low-grade inflammation. It may also result in a number of health conditions, such as high blood pressure, obesity, and diabetes that are all linked to chronic inflammation (13). 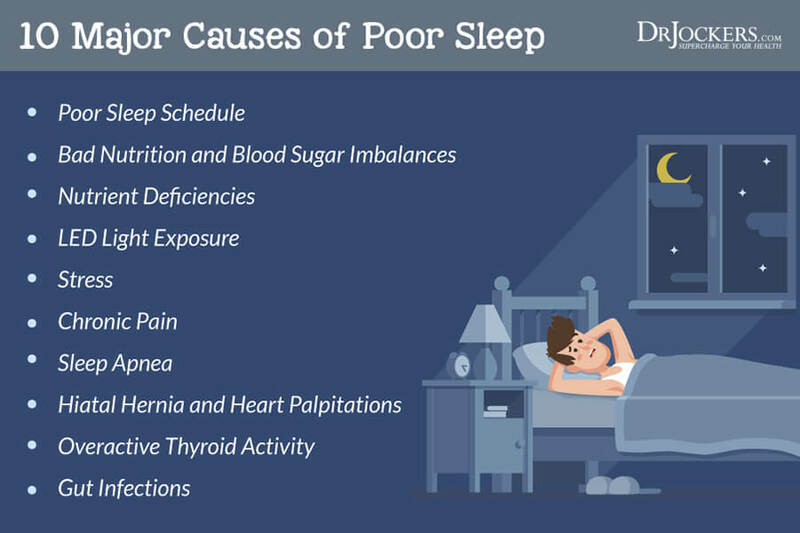 Learn more about how to reverse poor sleep in this article. Environmental toxins are all around you. They can be found in the air you breathe, the food you eat, the water your drink, and the products you use. Air pollution, smoke, heavy metals, and mold exposure are all examples of environmental toxins you may be subjected to. Conventional cleaning and body care products, medications, and even processed foods are filled with ingredients that are unnatural and toxic to your body. Long-term exposure to environmental toxins can become overwhelming to your immune system and result in increased chronic inflammation which may increase your risk of disease. You can learn how to test for signs of environmental toxicity in your body in this article. While it is important to lower your toxic load by buying organic and natural products and avoiding exposure to toxins as much as possible, it is impossible to completely eliminate them. This is why paying attention to other factors, such as your diet and overall lifestyle is incredibly important. Conventional treatment of inflammation often involves over-the-counter medications, such as non-steroidal anti-inflammatory drugs (NSAIDs), such as ibuprofen, naproxen, and aspirin. NSAIDs block the Circulating Immune Complex (CIC) activity in your body. CIC is a protein chain activated by your immune system causing pain, swelling, and redness to promote recovery. The problem is that NSAIDs affect all CIC’s in your body, including the ones necessary to maintain the lining of your stomach, intestine, kidneys, and liver. As a result, long-term use of NSAIDs can result in stomach ulcers, kidney and liver toxicity, and leaky gut syndrome. 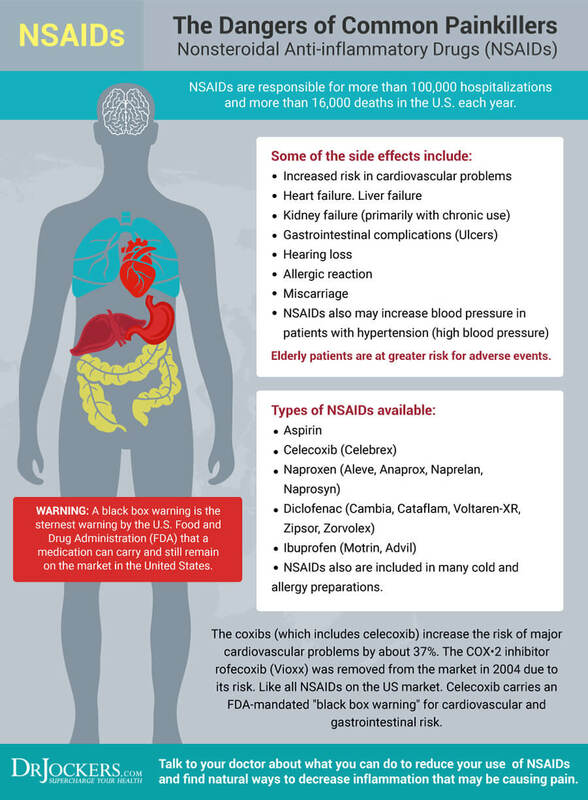 NSAID use accounts for 10 to 20,000 deaths a year in the US and many more hospitalizations due to liver and kidney damage or intestinal bleeding (14, 15, 16, 17). Instead of relying on NSAIDs to lower inflammation, it is important to understand and address the underlying causes of chronic inflammation. Diet and lifestyle factors are both important factors in lowering inflammation and recovering from inflammation-related pain and illness. The good news is that there are some fantastic anti-inflammatory herbs you can use to fight inflammation. Check out my top 4 anti-inflammatory herbs and supplements. Eating an anti-inflammatory, nutrient-dense diet is crucial to reduce inflammation and prevent or recover from inflammation-related pain and disease. Using anti-inflammatory herbs plays an important role in an anti-inflammatory diet. Anti-inflammatory herbs are easy to use in your kitchen. You can also find them in supplements to boost your body’s ability to reduce inflammation and repair any damage. 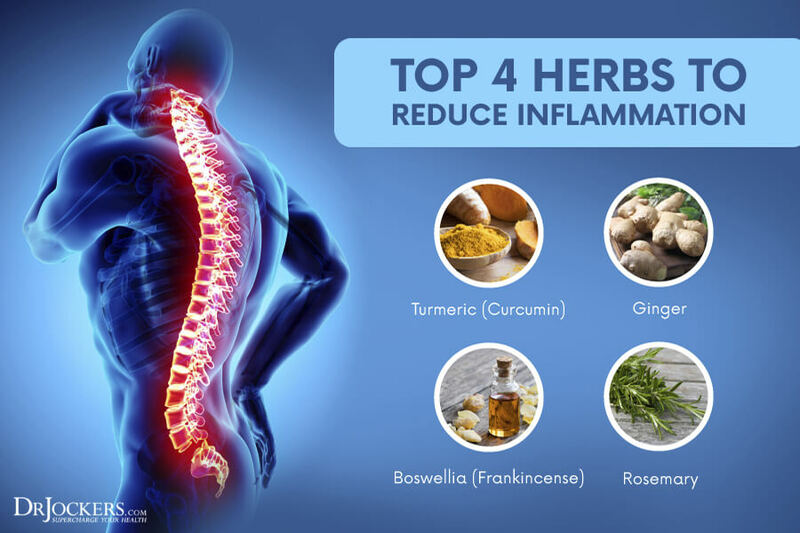 My top four favorite anti-inflammatory herbs include turmeric, boswellia, ginger, and rosemary. I use them regularly, and once you learn their powerful benefits, I’m sure you will utilize them too. Turmeric is one of the most potent anti-inflammatory herbs. It is a staple in Indian cuisine and is the main spice used in popular curry dishes. It’s known for its unique, warm, and somewhat bitter taste. Turmeric is used to flavor and color various foods and condiments, including curry powder, mustard, butter, and even cheese. Turmeric is not only an important part of the Indian diet, but it has been used in traditional Indian and Chinese medicine for thousands of years for its health benefits. One of the earliest documented uses of turmeric dates back to 250 bc when Susruta’s Ayurvedic Compendium recommended turmeric to relieve the effects of poisoned foods (18). Turmeric finally began to gain popularity as a delicious spice and a powerful supplement in the United States and other Western countries over the past 30 years. Turmeric is actually one of the most researched spices. The US National Center for Biotechnology alone has over 6,000 studies available on turmeric and curcumin. The secret of this anti-inflammatory herb lies in its active compound, a powerful antioxidant, called curcumin. Curcumin is known for its abundant medicinal properties. One of its top benefits is its ability to lower inflammation. Studies show that turmeric is able to reduce pain and inflammation just as well as ibuprofen without harmful side-effects. Other studies have shown that turmeric can improve inflammation in those with ulcerative colitis, diabetes, osteoarthritis, and lupus (20, 21, 22, 23, 24). Ginger is similar to another anti-inflammatory herb, turmeric. They both belong to the rhizome family, which means that they have an underground stem that grows horizontally forming roots downwards while growing sprouting stems and leaves above ground. Ginger is a powerful anti-inflammatory herb that has been used in China and India as a natural remedy for 5,000 years. Thanks to the Roman Empire trade, ginger became popular in Europe as well. It is commonly used for dishes, teas, and juices, as well as a supplement. While ginger has over a hundred different chemical components, gingerol is its most important active compound providing its powerful health benefits. One of the most most important qualities of this anti-inflammatory herb is its ability to reduce inflammation (29). A 28-day study, for example, has found that patients who were given two grams of ginger experienced a significant reduction in colon inflammation markers compared to the placebo group. This suggests that ginger is a powerful anti-inflammatory herb that can play an important role in colon cancer prevention. Other studies showed that the anti-inflammatory herb can lower inflammation in osteoarthritis, exercise-induced muscle pain and inflammation related to obesity and metabolic syndrome (30, 31, 32, 33). Boswellia, or otherwise known as Indian Frankincense, is a potent herbal extract that comes from the Boswellia serrata tree. It has been a popular anti-inflammatory herb used by Asian and African cultures for its medicinal properties to treat a number of health conditions, including. chronic inflammatory illness. You can take advantage of this anti-inflammatory herb in various ways. Boswellia is commonly used as a pill, resin, or cream. Research has found that boswellia can reduce inflammation in osteoarthritis and rheumatoid arthritis. It may be beneficial in lowering inflammation and inhibiting cancer growth in cancer patients (25, 26, 27). Boswellia is particularly beneficial when used in combination with another anti-inflammatory herb, curcumin. According to a comparative, randomized, double-blind, placebo-controlled study on osteoarthritis patients, boswellia and curcumin can be used together safely and effectively. They synergize together to reduce inflammation (28). Rosemary is a fragrant, delicious, anti-inflammatory herb native to the Mediterranean and popular all over the world. It belongs to the same herb-family as oregano, thyme, basil, and lavender, and is often used alongside them in a variety of dishes. 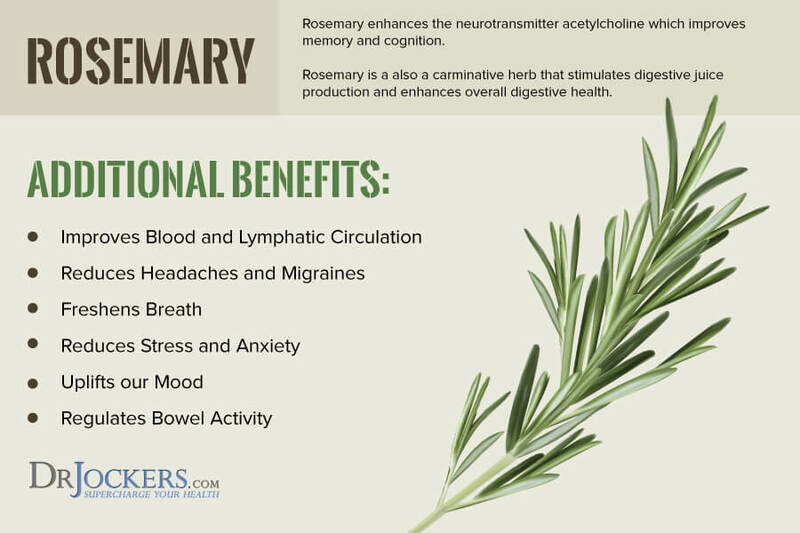 Rosemary is not only a delicious herb commonly used in the kitchen, but it is also incredibly powerful. Rosemary is a rich source of antioxidant and anti-inflammatory compounds. It has been celebrated as a beneficial anti-inflammatory herb for its medicinal properties for centuries. Besides anti-inflammatory herbs, you can benefit from some additional anti-inflammatory compounds such as bioflavonoids and systemic enzymes. Bioflavonoids, or flavonoids, are a group of plant pigments that can provide protection against many diseases. They are known for the antioxidant, anti-inflammatory, anti-viral, anti-carcinogenic, and anti allergic properties. There are over 4000 known bioflavonoids. Two of my favorites are quercetin and rutin which I love for their anti-inflammatory benefits. Quercetin is a flavonoid that can be found in vegetables and fruits, such as leafy greens, broccoli, tomatoes, and berries. It is rich in antioxidants, full of anti-inflammatory benefits and can fight free-radical damage. Research shows that it is a powerful anti-inflammatory compound that can effectively reduce inflammation and improve your immunity (36). Rutin can be found in various vegetables and fruits, including apples, citrus, figs, green tea, black tea, and buckwheat. Rutin has powerful antioxidants that can help your body to use vitamin C better and which helps to produce collagen. Research shows that rutin can reduce inflammation and pain in rheumatoid arthritis and other inflammatory diseases (37). 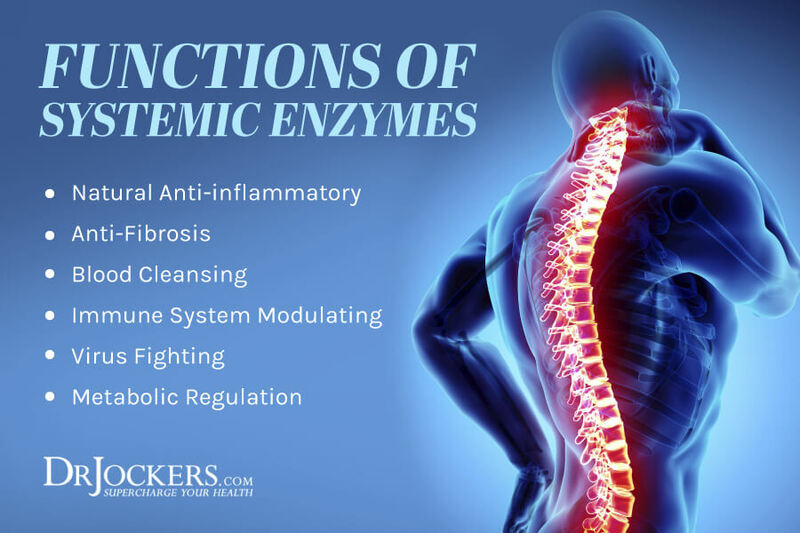 Your body uses systemic enzymes to carry out virtually every metabolic function. They are essential for an immune system and for optimal digestion. They are powerful biocatalysts that carry out and speed up chemical reactions in your body. More importantly, according to research, they have full-body anti-inflammatory benefits (38, 39). You can receive the benefits of enzymes by eating lots of raw, sprouted and fermented fruits and vegetables. However, you may also benefit from supplementing with enzymes, especially if you are dealing with chronic inflammation. Enymes can be used in combination with anti-inflammatory herbs and bioflavonoids. Proteo Enzymes are my favorite enzymes which I recommend to my patients all the time. They are absolutely fantastic in reducing inflammation and in aiding recovery. Inflam Defense™ is my favorite supplement to lower inflammation and to protect you from health issues which may result from inflammation. Inflam Defense™ is a powerful combination of anti-inflammatory herbs, such as curcumin, boswellia, ginger, and rosemary extract as well as nutrients from quercetin and rutin, and proteolytic enzymes. I love this product because it can help downregulate the inflammatory process. It can help you if you are dealing with the negative impact of acute or chronic inflammatory conditions. If you are looking to keep inflammation under control and have a healthy immune system, choose Inflam Defense™. Take one capsule twice a day between meals or for advanced protection take two or more capsules twice a day between meals or as directed by your health care practitioner. Inflammation is both important and beneficial and can promote recovery from injuries, infections, and other pathogens. 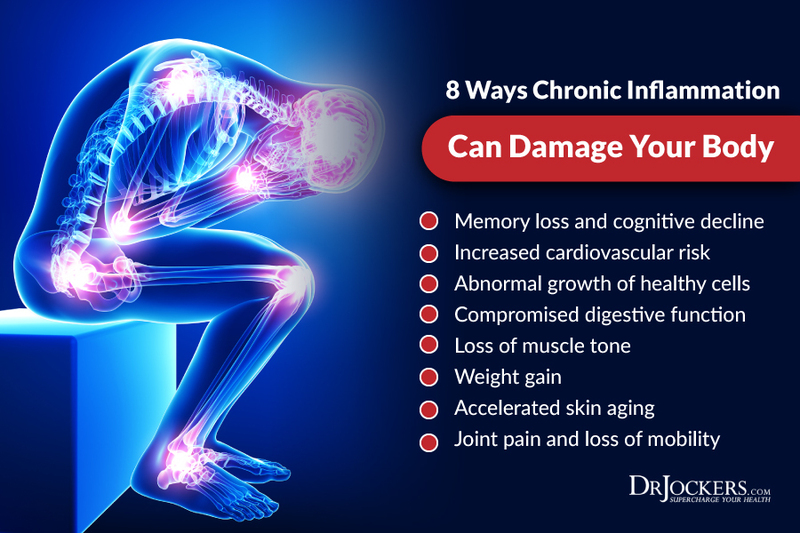 However, when inflammation turns chronic as a result of inflammatory diet, blood sugar imbalances, leaky gut syndrome, chronic stress, or lack of sleep, it can lead to pain and disease. Taking NSAIDs is commonly suggested by healthcare professionals and regularly used by those who suffer from chronic inflammation and pain. The problem is that the long-term use of NSAID’s can result in stomach ulcers, kidney and liver toxicity, and leaky gut syndrome. Luckily, there is a better and more natural way to lower inflammation in your body and to protect yourself from disease. Anti-inflammatory herbs, such as turmeric, boswellia, ginger, and rosemary, bioflavonoids, such as quercetin and rutin, and proteolytic enzymes are incredibly powerful in fighting inflammation and improving your health. 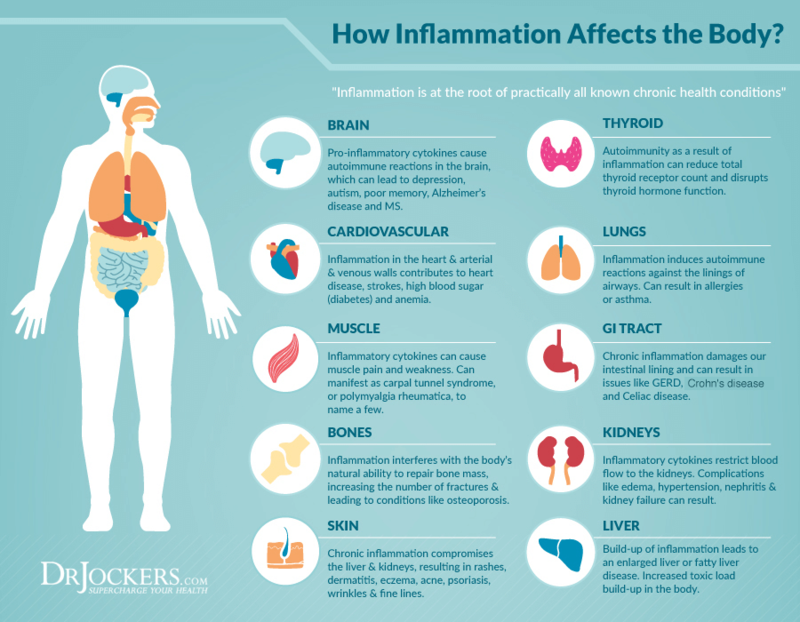 This is why I recommend Inflam Defense™ to anyone dealing with inflammation. This supplement is a powerful combination of anti-inflammatory herbs, nutrients, bioflavonoids, and proteolytic enzymes. It can help downregulate the inflammatory process. Give Inflam Defense™ a try to lower inflammation, reverse its negative impacts, and to regain your health. Some what confused, you say “If you are looking to keep inflammation under control and have a healthy immune system, choose Inflam Defense™. Take one capsule twice a day with meals or for advanced protection take two or more capsules twice a day or as directed by your health care practitioner. The label directions state: As a dietary supplement, take two capsules per day between meals, or as directed by your health care practitioner (check spelling on the label!) Are the label directions to address an already inflamed condition? Please advise? thanks! Yes we just changed it. It is better to take this between meals as the systemic enzymes will have the impact that way. Hello, do you consult online? How do I access this option?